Olivia Cleans Green: Integrative Nutrition Released a Cookbook! And it's just 99 cents! Integrative Nutrition Released a Cookbook! And it's just 99 cents! Exciting news guys: Institute for Integrative Nutrition just released a cookbook and it's only 99 cents on Amazon now through Friday, February 19th! 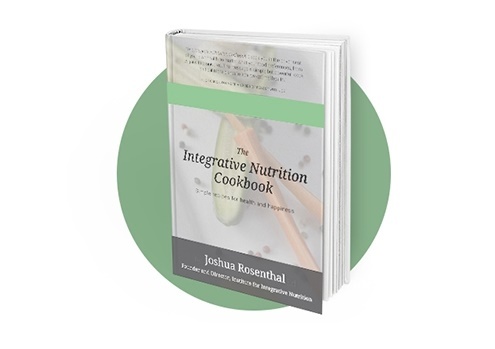 In The Integrative Nutrition Cookbook, Joshua Rosenthal provides 80+ simple recipes for health and happiness, spanning multiple dietary restrictions and preferences from vegan to grain-free. I’ve spent 30 years in the nutrition world, and noticed one major challenge: recipe books often over-complicate. Cooking has been glamorized on TV with shows like Chopped, Iron Chef, and Cutthroat Kitchen. But just because you’ve never cooked “sous vide” salmon or learned to “chiffonade” basil doesn’t mean that you can’t make delicious, wholesome meals that will make you feel nourished and satisfied. We’ve all tried a “15-minute recipe” only to have it take an hour. And don’t get me started on how many pots and pans some recipes require! You’re not alone – this happens all the time. So let me help you un-complicate cooking once and for all! Today, I’m inviting you to download my e-book - which has a cover price of $16.99 -for only 99 cents. Based on my experience in Integrative Nutrition's Health Coach Training Program, Joshua is an amazing teacher and the person I'd want to learn how to cook from if I was just getting in the kitchen. Heck, I'm excited to learn from him now and I've been cooking for 30 years! That's why I literally just bought the book on Amazon then ran to share this awesome deal with you before the 99 cents offer ends. Hope you can snag a copy!